By the time Donald Trump had stamped the White House with his personal brand, the New York real-estate mogul had lent his name to a number of products and services. Numbering among the many short-lived Trump-branded commodities are mail-order steaks (2007), vodka (2006), and a board game (1989). But the largest, most-expensive, and likely rarest bit of Trump-brand licensing came before any of the aforementioned signature merchandise. Behold, the Trump Limousine. If you read three articles about this automotive tribute to “The Donald,” you will likely collect three separate sets of facts about this rolling homage to executive self-care. But enough is known to piece together a rough outline of the car’s brief history. To convince GM to move forward on limo project, Donald Trump promised to purchase at least 50 copies of the car himself, thus helping to offset the development costs and essentially guaranteeing adequate production volume for the aftermarket conversion company. This conversation between Trump and GM likely took place in 1987. To seal the deal, GM executives reportedly gifted Trump a Cadillac Allante. 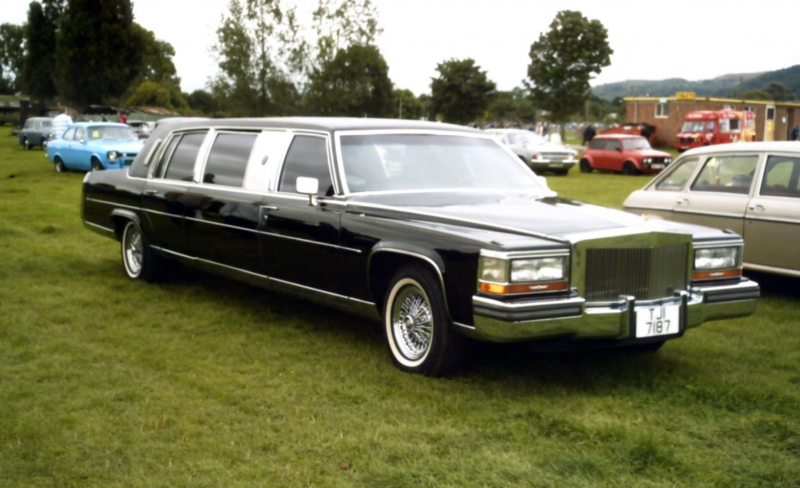 The result of this unlikely union was the 1988 Cadillac Brougham Limousine Trump Edition, which made its public debut in Atlantic City, New Jersey, at the ’88 Limousine and Chauffeur Show. Two prototype models of the limo were presented: the topline Trump Golden Series, with a $65,000 base price, and a slightly less opulent Trump Executive Series, which listed for $55,000. Both limos featured cabins outfitted to Trump specifications, and included such Eighties high-tech equipment as a fax machine, cellular telephones, and a VCR player, as well as a wet bar, a fold-out rosewood desk, and oodles of rosewood trim accents. The Trump Limousine cabin may illustrate the gap that sometimes exists between luxury and tastefulness. Unique to the Golden Series was additional gold-tone interior and exterior trim and Vogue-brand gold-stripe whitewall tires. The Trump Limo concepts were finished by New York coachbuilder Dillinger-Gaines, and, apart from the wheelbase stretch, were mechanically unchanged from Cadillac Broughams they were based on. 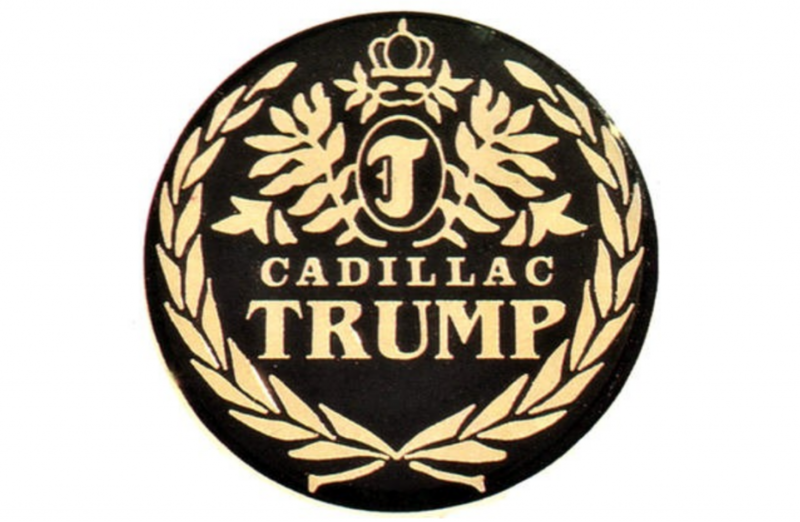 As such, the Trump Cadillacs were powered by a 140-horsepower 307-cubic-inch V8 mated to 4-speed automatic transmission. In addition to the exterior brightwork found on the Golden Series, both Trump Limos were marked by a stainless-steel B-pillar adorned with a sizable Trump Cadillac crest. Unfortunately, the Trump Limousine project never got much beyond the introduction stage. A stock-market “mini-crash” on October 19, 1987, triggered a fairly significant recession, which severely crimped demand for limousines. Additionally, Donald Trump never made good on his order of 50 limousines. 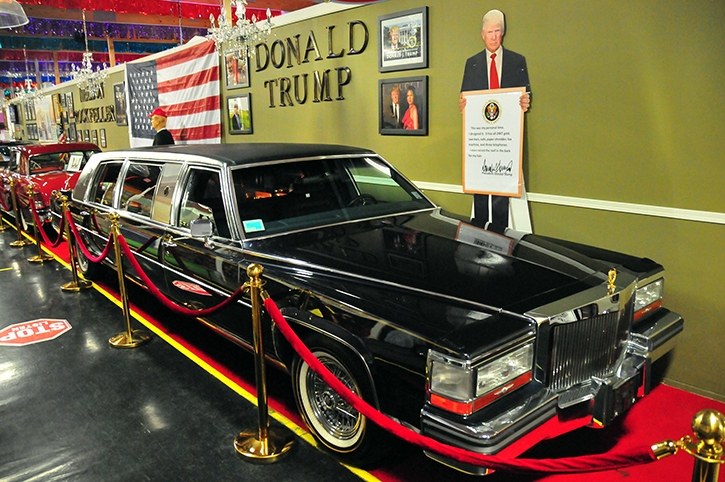 Currently part of the Volo Auto Museum collection, the Trump Golden Series limo is still shod with Vogue-brand tires. By most accounts, only the two concept limos were built. The Golden Series prototype was purchased by Trump himself and eventually ended up in the hands of the Volo Auto Museum in Volo, Illinois. The Executive Edition prototype now resides in the U.K. Written by: Tom Appel on January 2, 2019.on March 4, 2019.